Destination Knowlton >: The Amazing Race...Knowlton Style! We've all seen the bright posters for the upcoming Brome Lake DuckFest and now there has been a new and enticing twist to this years party: the First Great Duck Race! While many of us are anxious to enjoy the Brome Lake Duck Festival and the street festival atmosphere that invades the streets of Knowlton like an intoxicating carnival parade we are also clutching our lucky Duck Race tickets (or two or three tickets!) 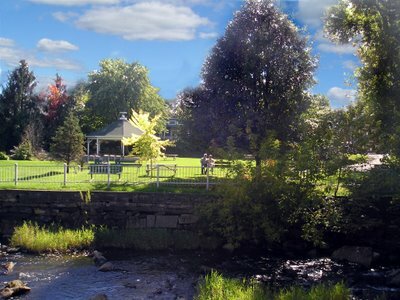 and can't wait to see the hundreds of "rubber duckies" roll down the Coldbrook! The anticipation is growing in Knowlton for the first ever Duck Race to be held Sunday, October 1st, as the closing event of the very popular Duck Festival which starts the last weekend in September and runs two consecutive week-ends marking one of the highlights of our busy tourist season. How does it work? The hundreds of bright yellow rubber ducks are each numbered and if you hold a ticket your ticket number will correspond to a number printed on one of the ducks. The ducks are then dumped, cerimoniousely of course, into the Coldbrook where they wind their way down towards the finish line. There are prizes for the first seven ducks to cross the line. First prize is an amazing voyage for two courtesy of Swiss Air! Other prizes include gift certificates and of course just participating gives you bragging rights to the fact that you sponsored a duck and helped raise money for a great cause. A part of all monies raised will go to the Shriners of Montreal, who are well-know for helping sick children in hospitals, and the Quebec Youth Help Line which helps provide listening lines for youth in need of help in Quebec. Very worthy causes! Tickets have been on sale now all over Knowlton for some time at many popular businesses like Flanagans, the Knowlton Marina, the Star Cafe and other local Brome Lake Chamber of Commerce associates. The action starts at 1 pm, October 1st, in Coldbrook park. The duck race is a popular event in many Canadian cities and towns who wish to raise funds and also provide a unique event during festivals. The Knowlton Chamber of Commerce actually "rents" the little yellow ducks and they are flown in especially for the event and then they'll be fished out of the Coldbrook and dried off and sent to their next assignment! 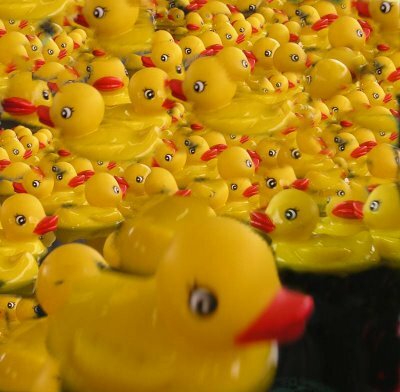 The next stop for the yellow ducks could be one of many Rotary Club of Canada events who have been holding duck races since 1988 to incredible success. Rotarians are responsible for sponsoring, promoting and selling over 52,000 Ducks since 1988, and local Rotarians around Canada have raised over $3.5 million to combate child abuse over the years. All the best for this first annual Duck Race and what a great idea to help rasise funds for such worthy and hellpful organizations. Tickets are $5 and are available until the day of the race at our best merchants in Knowlton and area. It caps off what is surely going to be an incredible DuckFest! We'll see you there!